1944년 평양시 평천리에서 공사를 하던 중 출토된 작은 보살상으로 높이 17.5㎝이다. 전면에 녹이 많이 슬었고 오랫동안 흙속에서 침식된 흔적이 뚜렷하며, 불에 탄 흔적이 많이 남아 있다. 삼국시대에 유행하던 반가상은 오직 백제와 신라에서만 그 유례를 찾아볼 수 있었는데, 이 보살상으로 새롭게 고구려의 예를 확인할 수 있어 주목된다. 머리에는 산 모양의 삼산관(三山冠)을 쓰고 있으며 고개를 약간 숙여 생각에 잠겨 있는 모습이다. 얼굴은 네모난 형으로 눈을 반쯤 감고 있고, 입가에는 엷은 미소가 번져난다. 상체에는 옷을 입고 있지 않아서 잘록한 허리가 그대로 드러나며, 하체에는 치마를 걸치고 있다. 치마에는 무릎 위쪽으로 선으로 새긴 주름의 형태만 간략히 묘사하다가 대좌(臺座)를 덮으면서 자연스럽게 늘어져 여러 겹의 수직 주름을 형성하고 있다. 연꽃무늬 대좌 위에 왼발을 내려 놓고 오른발은 왼쪽 무릎 위에 얹은 채 왼손으로 발목을 잡고 있다. 오른쪽 팔꿈치를 오른쪽 무릎에 대고 있는데 팔과 손이 떨어져 나가 원래의 모습은 알 수 없다. 하지만 손으로 턱을 괴고 생각에 잠겨 있는 모습이었을 것으로 짐작된다. 전체적으로 얼굴이 큰 편이나 가냘픈 몸매와 묘한 대조를 이루면서 생각에 잠긴 보살의 모습을 특징적으로 표현하고 있다. 만든 연대는 6세기 후반으로 추정되며, 출토지가 확실한 고구려의 반가사유상으로 주목되는 작품이다. 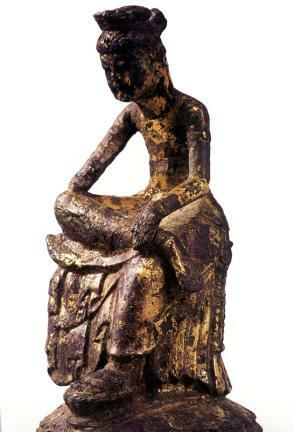 This 17.5-centimeter high Maitreya statuette, discovered at a building site in Pyeongcheon-ri, Pyeongyang in 1944, is marked by a lot of rust covering most of the body and scorch stains probably caused by a fire that razed the shrine where it had been stored. The statues of Buddha assuming a pensive posture had been found only in the archaeological sites of Baekje and Silla, suggesting that statues of this kind had been made only in the two ancient Korean kingdoms. 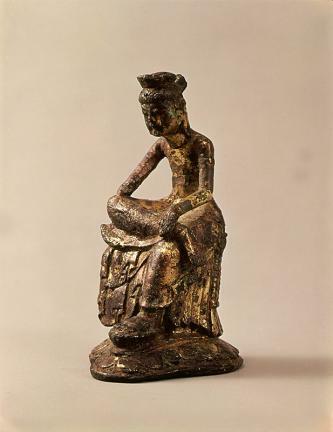 The discovery of this statuette in 1944, however, revealed that Goguryeo, the third earliest Korean kingdom, had also worshipped bodhisattvas assuming a meditation pose. The bodhisattva statue features the head in a tri-peak headgear gently bent forward, square face with half-closed eyes and smiling mouth, naked upper body, slender waist, and skirt-like, lower garment draped down to cover the entire lower body and the pedestal, creating numerous folds as it hangs down. He has his left foot pendent on a small lotus pedestal and the right crossing the left knee. He holds the right ankle with his left hand but has lost the right forearm, although the fingers of his right hand are clearly touching the right cheek. The head is disproportionately large compared to the slender body; other details including the excavation site show that it is a work of Goguryeo (37BC-668) in the late 6th century.